I have made this card for a very special friend that lives in WA. 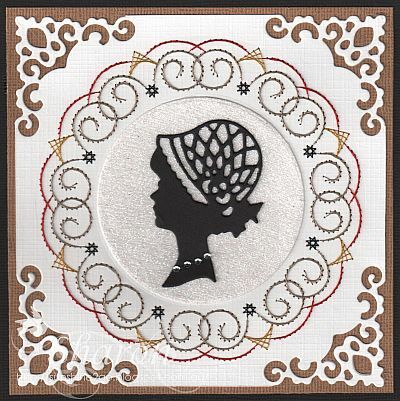 The pattern is by Ann's Paper Art, a392 and is also available in the Stitching Sheet book # 5. I have stitched with Mettler polysheen, 6043, 3251, 2336. The edge die is Spellbinder S5-168 there are 9 in the set so there is plenty to choose from. 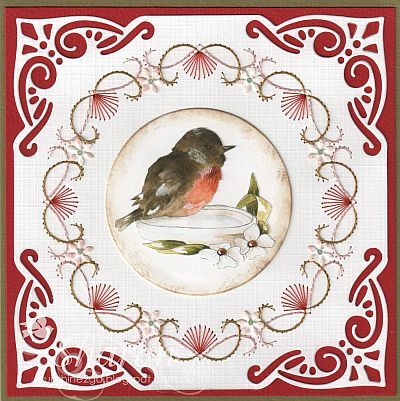 New decoupage by Marieke design 2731 fits perfectly in the Nellie Snellen oval die mfd057. 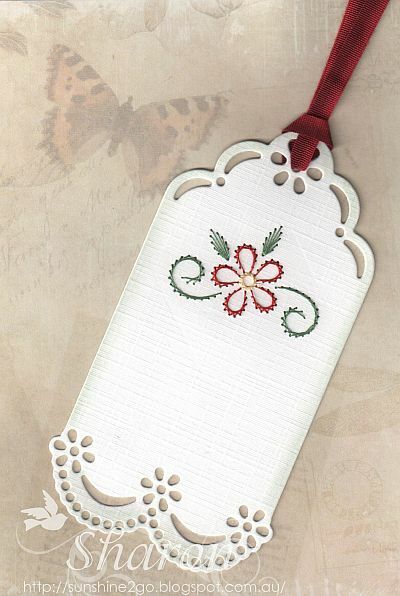 Hobbydots have been used to embellish the card. 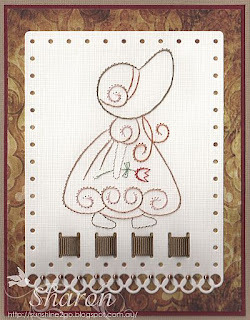 This month Ann has released 2 new patterns along with the stitching stencils. Threads are Mettler Polysheen 442, 1755,1312. 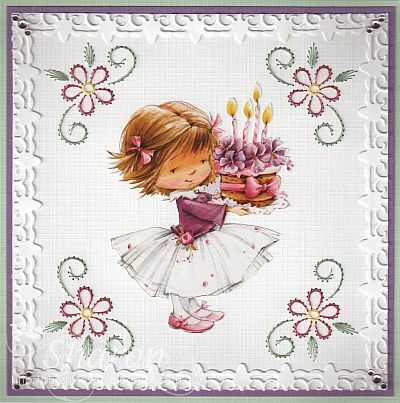 The gorgeous decoupage is by Marieke 2732. 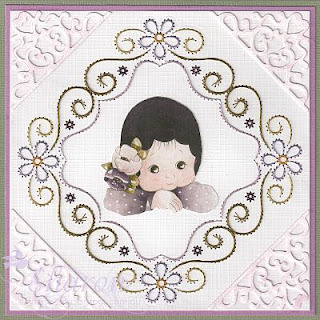 All dies used are from the Nellie Snellen range, the corners are mfd027 and the little flowers are sd004. I have distressed the flowers and circle, hobbydots have been added to the centre of the flower. This is the card that I have completed for this months challenge at Ann's Paper Art. 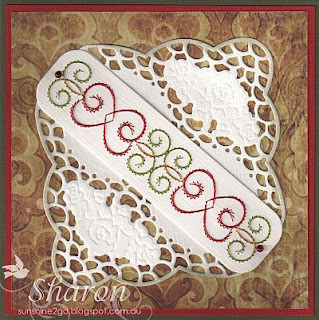 I have stitched pattern number a732 onto Spellbinders S5-135, Fancy Ribbon Threader. Joy! Vintage Paper Block is perfect for this occasion. 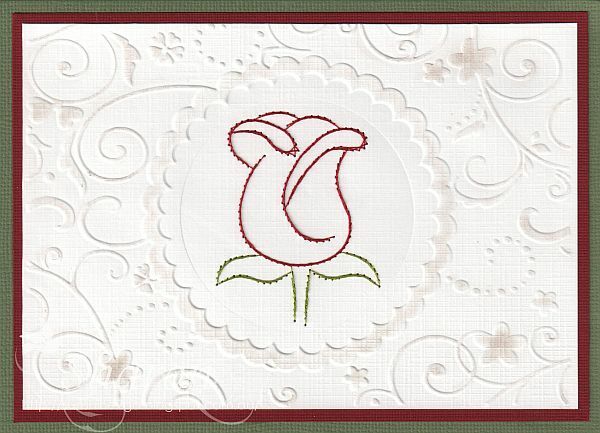 This months theme is to make a card combining a stitching pattern from Ann's Paper Art webshop with a die cutting stencil of your choice. 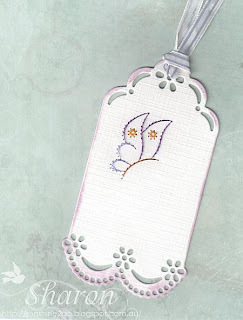 Have a look at Ann's Stitching Stencil blog to see examples of cards made with these fantastic stitching stencils. Closing date is Monday 15th of April 2013 8pm. Remember you have to be in it to win it, so come along and join in the fun. I have been one of the lucky ones to test these stitching stencils and they are fantastic. 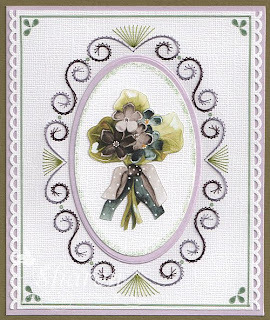 I have made my April exchange card for a lovely lady named Ria. Pattern # a671 is available from Ann's Paper Art. 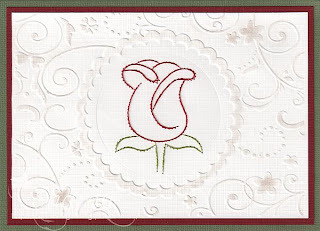 The beautiful flower punch by Nellie Snellen has been slightly distressed on the end of the petals. I added small pearls in the centre of the flower. 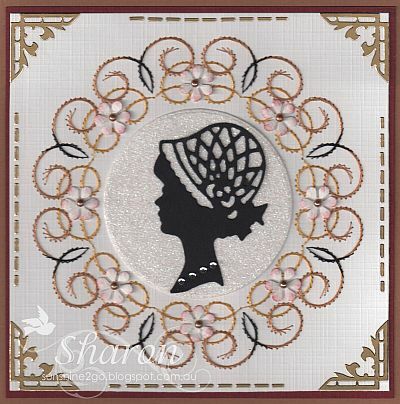 The glitter circle has been die cut with Nellie Snellen mfd055, the lady with Marianne Creatables LRO140. Small gems have been placed around the neck. Doodey peel-off stickers decorate the edge. I have made some samples using the new Stitching Stencils from Ann's Paper Art. Ann also has a Challenge this month and you have a chance to win one of the sets.